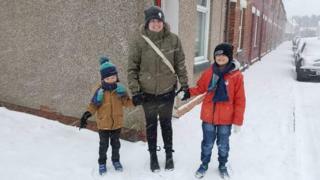 A Cardiff mother who discovered she is on the autism spectrum at the age of 32 might never have been diagnosed had her son not been assessed, she says. Kat Williams, 33, was told by specialists assessing her eldest son Matty, 10, for dyspraxia that they suspected she already had a diagnosis. After researching the condition, Ms Williams discovered how women and girls are better at “masking” traits. “I can be a lot more forgiving of myself now,” she told BBC Radio Wales. Mother-of-two Ms Williams said she suspected Matty of having dyspraxia about five years ago. When doctors thought it was something else and referred Matty for further tests, specialists suspected Ms Williams was also on the autism spectrum. “The way I was interacting with them – the fleeting eye contact – and the amount of research I was doing was almost next level. They just had an inkling,” she told BBC Good Morning Wales. At the time she was dealing with depression and anxiety so did not follow up the information. Her interest was piqued again last year when she was doing research and stumbled upon information which struck a chord. “I found that women are better at masking the traits of the condition, so there is a lost generation of women without a diagnosis,” she said. After discussing her research with her mother, things started to click. Ms Williams said that while she was good at making friends when she was growing up, she struggled to keep them. “I would mask my own personality and mirror the behaviour of friends to fit in – it was exhausting,” she explained. Ms Williams, whose youngest son Aaron, six, is now undergoing tests for autism, said when she told family and friends, most were either unsurprised or assumed she already had a diagnosis. She added: “It has made a huge difference. For me, it is knowing why I find some things difficult.